I Got a Booking Request! What's Next? 1. When you receive a booking request, you will receive an email notification. The request will also appear on your Dashboard in the menu on the left-hand side of the webpage. Under Bookings, there will be a pending booking request. Click on the request. You will be redirected to the booking request page. 2. 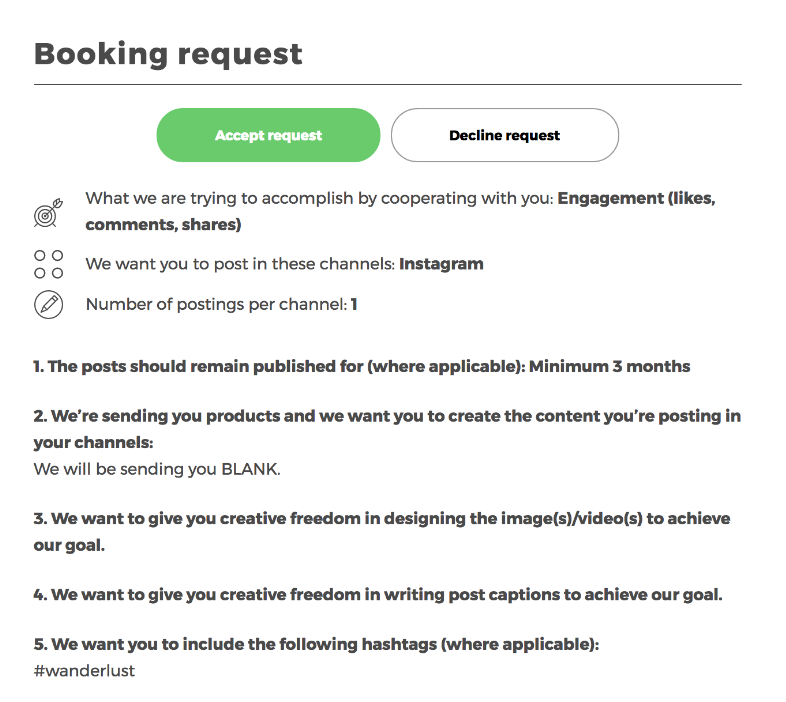 On the booking request page, read the content of the Booking Request. The request will include a short description of the collaboration, what the brand wants to accomplish with the collaboration, the date the brand wants you to publish the posts by and other pertinent information. The brand also sets a Budget based on your average fee. This budget may be higher or lower than your average fee depending on the scope of the booking. It is up to you to decide if you are willing to accept the deviation from your average fee. 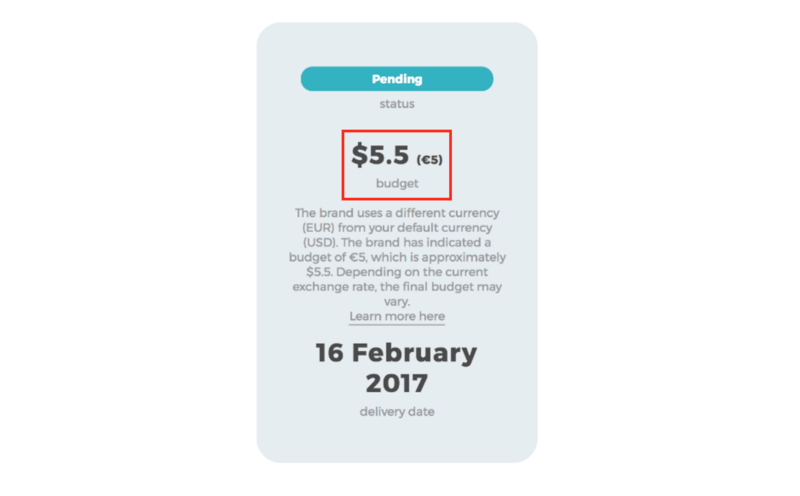 Note: If your selected payment currency differs from the brand's, there will be two approximated budgets, one in USD ($) and one in Euro (€). The larger number will be your selected payment currency and the smaller number will be the brand's selected currency. Our exchange rate is based on data provided by Yahoo Currency Converter. The exchange rate will not be locked in until you accept the booking request, so the final budget may vary. You can decide whether to accept or decline the booking request. You are also welcome to negotiate the terms of the booking. You can do this by direct messaging the brand with any changes you'd like to make. You can also send them any questions that you may have. If the brand agrees to the requested changes, the brand will edit the booking request. 3. If you accept the request, the brand will fund the booking. The funds will be kept secure with our payment provider, Mangopay, and neither you nor the brand will be able to access the funds. After you accept the request, you can begin the booking job. We do not recommend that you begin working on a booking before the payment from the brand is verified. 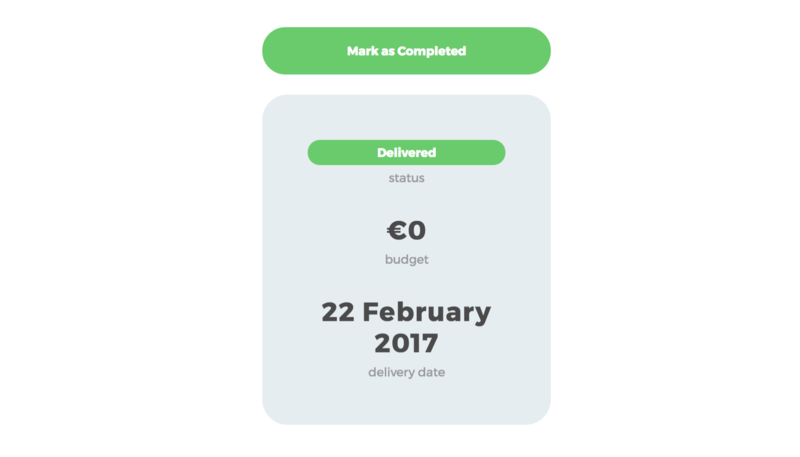 If the brand hasn't funded the booking, and there is two days or less until delivery date, you will be able to cancel the booking. A cancellation button will appear on the booking page. 4. When the booking is completed, send the brand the link(s) to the post(s) that you have published. Then, click Mark as Completed. You will be asked to confirm the delivery of the booking. The brand will confirm the booking has been delivered by clicking Mark as delivered. The funds will then automatically be transferred to your wallet. A 10% service fee is deducted from the payment. 5. You and the brand will be asked to give each other a review that will be visible on your profiles. 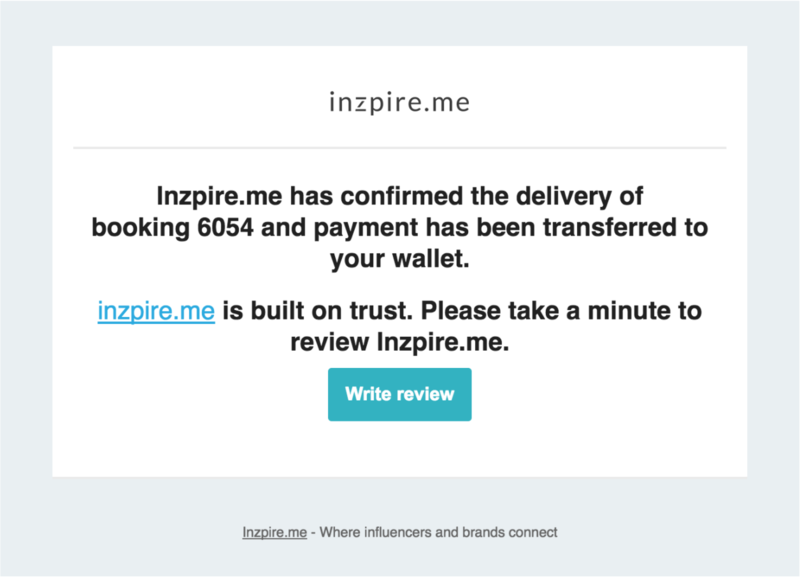 inzpire.me is built on trust, so it’s important to give honest and fair feedback. Have questions? Send us a chat!